Attendees swarmed displays such as this one from Yeti Coolers. 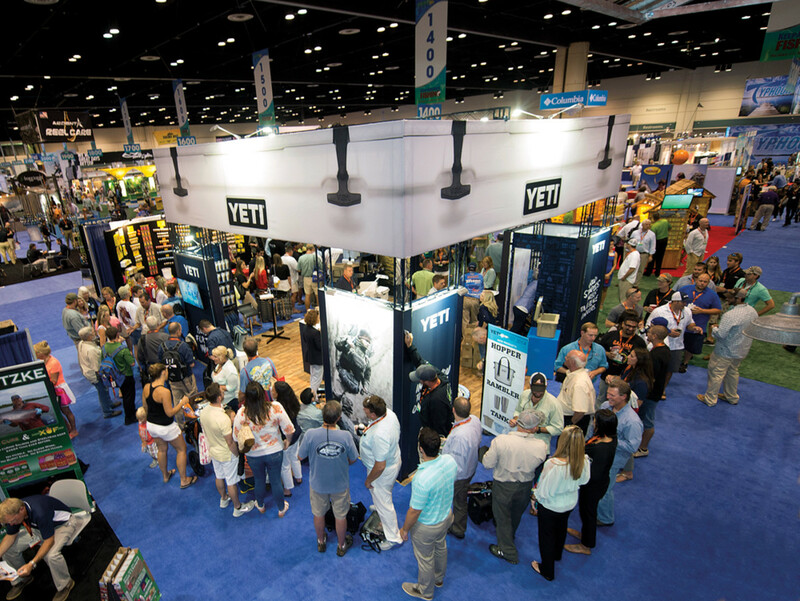 The 57th International Convention of Allied Sportfishing Trades show, held at the Orange County Convention Center in Orlando, Fla., this summer, drew a record 11,000 registered attendees, 480 exhibitors and 1,000 media representatives. This was the second year that ICAST (July 14-18), which the sportfishing association produces, and the International Fly Tackle Dealer Show, produced by the American Fly Fishing Trade Association, have co-located. They were held in Las Vegas last year; the 2015 shows will be in Orlando again. ICAST has been attracting a more diverse group of exhibitors, with increases in participation from the apparel and boating segments. “We’ve got L.L. Bean here this year,” she says. On the first full day of the convention about 600 members of the fishing and marine industries packed a hall at the convention center for the State of the Industry Breakfast. Florida Gov. Rick Scott made an appearance, and his remarks reinforced the state’s huge impact on the fishing industry. “The fishing population is rebounding … and we’re trying to convince the government that red snapper is important to the state of Florida,” he said. Scott was referring to red snapper management in the Gulf of Mexico and the shortened 2014 season. The fishing and boating community expressed collective disappointment after a saltwater fishing bill in the U.S. House of Representatives failed to address the community’s chief concerns. A reauthorization bill for the Magnuson-Stevens Fishery Conservation and Management Act — the primary law governing U.S. marine fisheries management — did not include many of the top priorities of the recreational saltwater fishing industry. Recreational Boating and Fishing Foundation president and CEO Frank Peterson delivered some news: A new report shows that interest in recreational fishing spiked last year, with 4.1 million newcomers to the sport — a substantial increase from the 3.5 million average new anglers per year between 2007 and 2012. The numbers were especially high among female and Hispanic anglers. 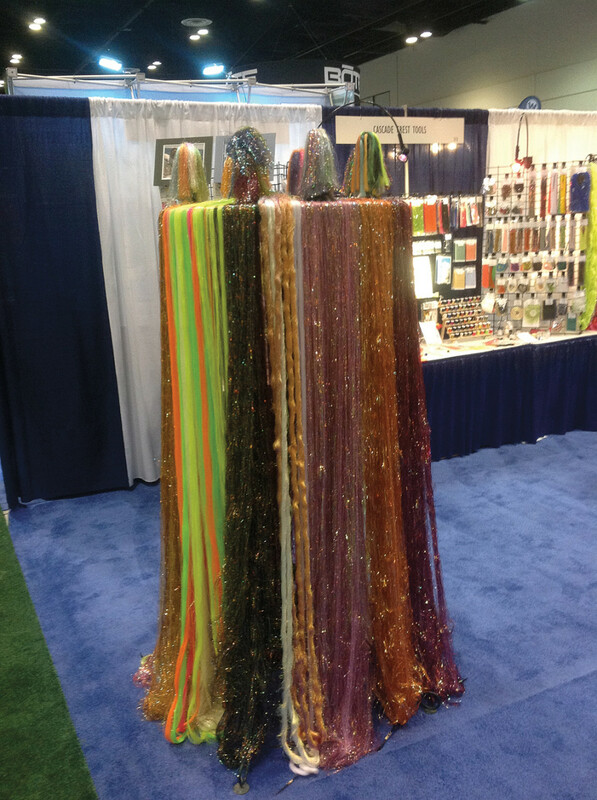 This stand of colorful hair skirts for lures made for an eye-catching part of one display at ICAST. In other news, the ASA asked guests at the breakfast to congratulate Doug Olander, who received the Professional Outdoor Media Association and American Sportfishing Association’s Homer Circle Fishing Communicator Award. Olander is an outdoor writer, conservation advocate and editor-in-chief of Sport Fishing magazine. 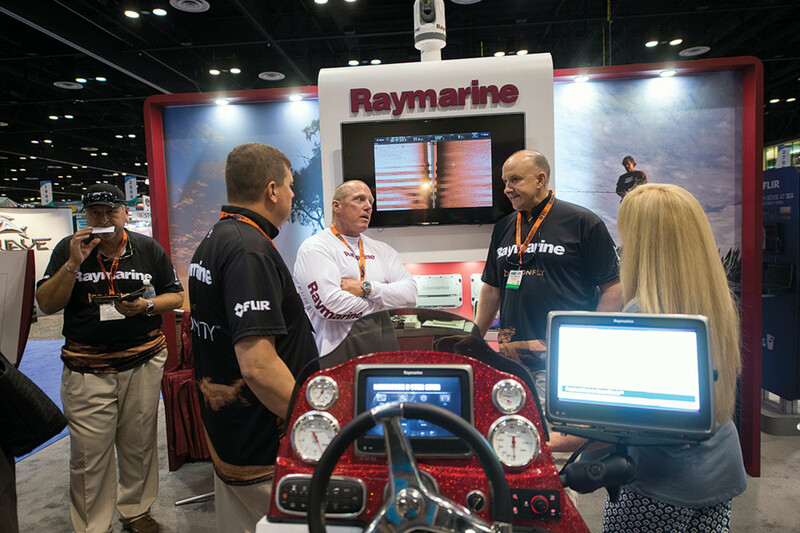 Electronics manufacturers Navico and Raymarine pushed out lower-cost products at ICAST that they expect will attract a larger share of the fishing boat market. “We’re making these technologies available to the masses who may have never had them before,” says Gordon Sprouse, marketing director for Navico, which owns the Lowrance, Simrad and B&G brands. The company introduced its Lowrance Outboard Pilot and Lowrance Elite-3x color sonar/fishfinder module at ICAST. With its 3.5-inch screen and 320-by-240 resolution, the Elite-3x hits the market at a $99 price point. I checked out the unit at the Lowrance booth. It delivers sharp images, and the user interface seems intuitive. Menus are easy to operate, and the unit comes with a quick-release bracket and transducer with a power cord. The Lowrance Outboard Pilot, which is for single-outboard boats under 30 feet, is $999 for hydraulic systems. The autopilot features Lowrance Smart Steer control for HDS Gen2 or HDS Gen2 Touch displays. The company also says its MotorGuide Xi5 with Pinpoint GPS can be linked to either of the Gen2 displays. With Raymarine’s aSeries 9-inch MFD, Murphy showed me images of a wreck at the bottom of New Hampshire’s Lake Winnipesaukee. The CP200 is $609.99, which includes the sonar module and transducer. Saltwater rod: Shimano American Corp.
Soft lure: Okuma Fishing Tackle Corp.